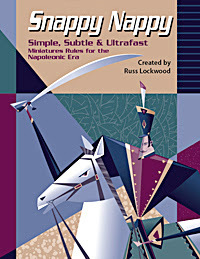 We, i.e., The Hartford Area Historical Wargames Society (HAHGS) now have a confirmed date and venue to hold our next "Campaign in a Day" using the Snappy Nappy rules by Russ Lockwood; Saturday April 20th, 2013, at new gaming space of The Time Machine hobby store in Manchester, Connecticut. Set up of the tables is planned for 10AM; players should arrive no later than 11AM, and we expect to conclude by 6PM at the latest. Each player will command a Corps sized force, under the overall direction of one player on each side who will act as Commander-in-Chief. The players will communicate their orders (from the C-in-C's) to their Corps Commanders, who will in return report back on their findings and progress to the C-in-C, all though the aegis of the Umpire/GM (aka, yours truly). I am tentatively planning on doing this all by way of cell phone text messaging, forwarding the messages after an appropriate delay (depending upon the distance involved and presence of interdicting forces, etc. The two C-in-C's will also command a Reserve Corps. The action will take place across at least six and probably 8-10 tables of various sizes, as both side seek each other out, maneuver, fight, and attempt to achieve victory! 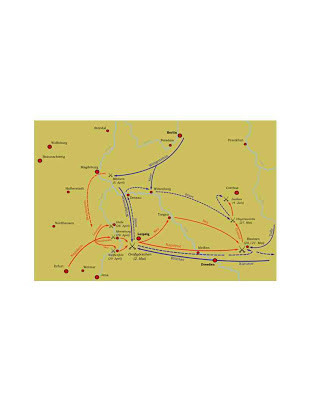 The overall map and situation will be roughly based upon that of the second (August to October) phase of the 1813 Befreiungskriege (War of German Liberation). 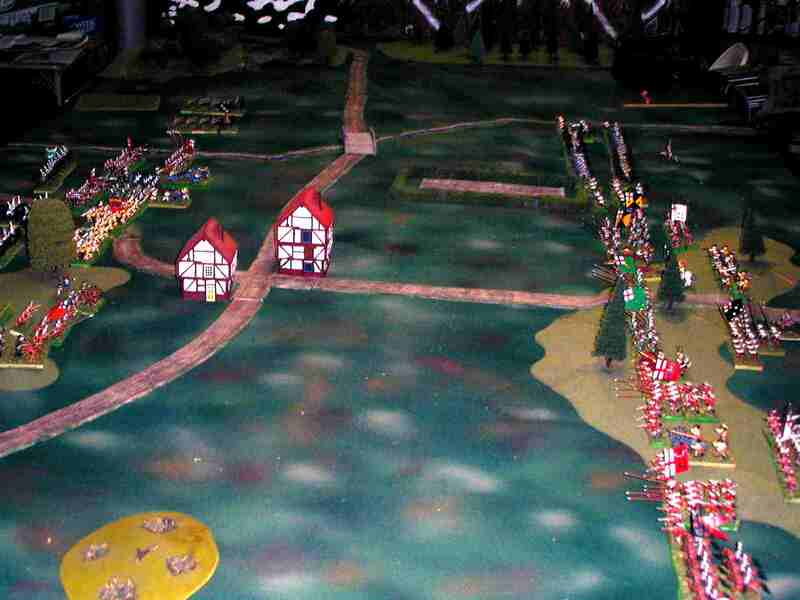 No attempt will be made to exactly recreate either the actual forces or terrain, bu rather the general situation. In part this is to allow us to accommodate as many players as may wish to be involved. The Snappy Nappy rules are easy to learn and play quickly, with plausible results. 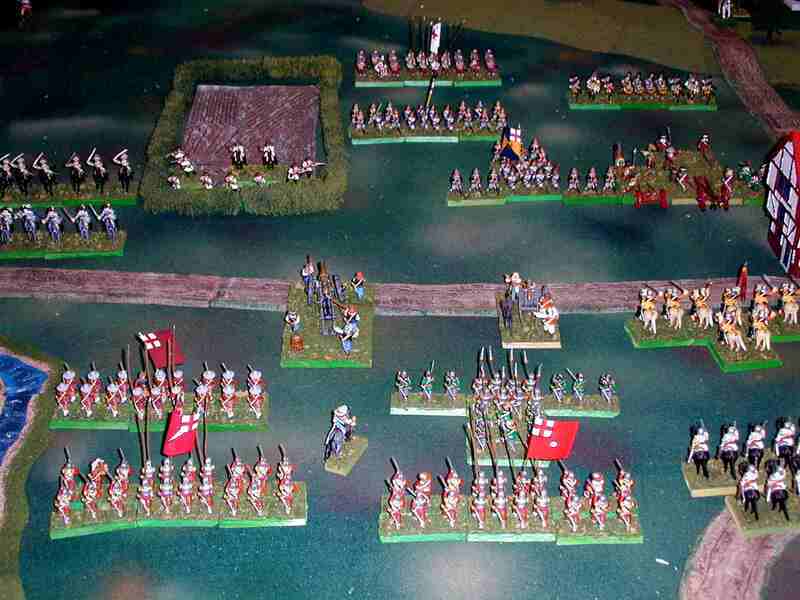 We are using 25/28mm miniatures and a "Bring Your Own Corps" format. The core members of the group probably have in excess of 10,000 Napoleonic troops between them, so we have plenty of troops available for use by those who don't have or want to bring their own (a Corps in Snappy Nappy, as defined below, will have less than 150 figures). A Corps can also be designed for you if you don't feel like designing your own... but IMHO, that's part of the fun! 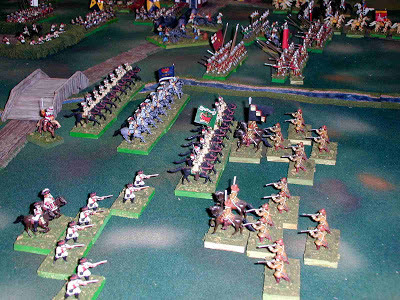 The August 1813 time frame means that a large percentage of all Napoleonic armies can be fielded for the event - we already having players planning on fielding Corps made up of Russians, Prusians, Austrians, and Swedes on the Allied side (with plenty of room for more of any or all of these), as well as French and Bavarians on Napoleon's side - we have plenty of troops available for other French Allied corps including Saxons, Poles (Grand Duchy of Warsaw), Kingdom of Italy, Rhine Confederation (Wurttemburg/Baden/Hessen-Darmstadt), Danes and of course, lots more French! We had a lot of fun with our pilot event, the 1809 Crisis on the Danube that we ran back in November; there is plenty of information about that, and Snappy Nappy here in this blog. While it is not necessary to have or purchase a copy of the rules to play, you will probably enjoy the event more if you do. They are available from On Military Matters for $29. Each player is allowed 200 points per corps. ONLY the C-in-C's Corps may contain troops rated as Guards (Others might be called Guards, but won't be rated as such, i.e. minor states). C-in-C is limited to 40% of units with Guard rating - others may be Elite (no limits) or lower; no Conscripts/Militia required (but not prohibited, either). Say no more than 25% of units may be Artillery (limit 1 Horse Artillery for Infantry Corps) and no more than 25% Cavalry, UNLESS the player builds a Cavalry Corps, in which case it may contain NO infantry and no more than 15% of the units may be (all Horse) Artillery. For those who don't have a copy, here's the SN Point system (Points are per STAND; Inf and Cav have 2 stands/unit, Arty only one). The D10 score neede to pass Morale is the critical variable.... In SN, I wouldn't count on Militia to hang around long at all unless they are very, very lucky! Any interested players (outside HAHGS as well as members) should contact me so that we can include you in our plans. The number of players will need to be equal on both sides; if there is an odd number of players, the extra player will be on the Allied side in view of their advantage in numbers historically. 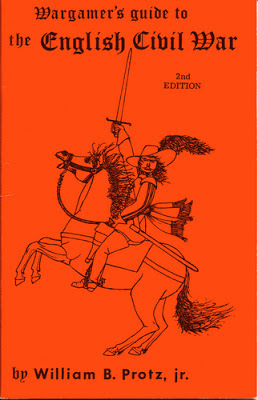 I have previously written about my fondness for H. Beam Piper's great Paratime adventure story, "Lord Kalvan of Otherwhen", set in a Thirty-Years War like technology alternate timeline North America, in which the composition and manufacture of Gunpowder is a secret used by the Temple of Styphon to meddle extensively in the squabbling politics and wars of the many princedoms and Great Kingdoms dotting the landscape. The staus quo is shattered when Calvin Morrison, a Pennsylvania State trooper, is accidentally caught up in a Paratime conveyor, and deposited in the backwater princedom of Hostigos (in the vicinity of Here and Now State College, PA). Kalvan rapidly befriends the Prince of Hostigos (and falls in love with his beautiful and spirited daughter, Rylla ). Hostigos is under the Ban of Styphon, cut of from all gunpowder supplies by the temple, and worse, the temples gold is used to support an invasion by Hostigos' neighbors. Kalvan's outime knowledge is used to manufacture their own gunpowder, which proves to be better than the Temple version. Other innovations follow, and Klavan soon earns the lasting hatred of Styphon's House, as they start to lose their grip on the gunpowder monopoly. The original novel has several excellent battles and other combats in it, and is a great read. It has, unfortunately long been out of print, although it is usually available second hand at a reasonable price. Continuing after Lord Kalvan, the new Great King of Hos-Hostigos finds that hios headaches only increase as his lands are trargeted by the forces of Styphon for destruction. Kalvan takes the offensive against the House of Styphon, and seeks out new allies in the Sea of Grass. In the 2nd sequit looks like Kalavan will accomplish the impossible and defeat the vast Host of Styphon, and spare his people the horrific the "investigation" of Styphoni Archpriest Roxthar. Facing the bitter necessity of leaving behind their homes, Kalvan's army and many of his people commence a vast relocation, hoping to find a new home away from the clutches of Styphon's House. Having relocated in the Upper Midwest, with a new capitol at the site of Here and Now Detroit, success seems to load only to new and greater challenges for Kalvan and his people. My older daughter, (sometimes aka "The Princess" to my "Emperor"), asked what I wanted for Christmas, and I took advantage of a sale that Peqoud Press was having, and had her acquire the two latest Kalvan Sequels by John Carr, "which I just finished reading: The Fireseed Wars (534 pages) and "Gunpowder God" (517 pages). Both were great reads, with further development of the characters of Kalvan's companions and his enemies, as well as a developing crisis on Home Time Line for the keepers of the Paratime Secret, the Paratime Police. There is plenty of intrigue, battles (including the first naval action of the series), innovations, and more among the pages of these novels, which I tore through in rapid succession. These hardcover are produced to a very high standard, and the cover illustrations are excellent. The books are quite pricey, though, at $36 per copy plus shipping. Thus, I was pleased to discover on John's newly redesigned website that, the first three sequels are now available as E-books for just $8.99, which is quite affordable. There is even a free download of the first edition of Great king's war (the 2nd edition is revised and has 12 additional chapters). Also newly available in E-book format are the two sequels to H. Beam Piper's "Little Fuzzy", as well as Piper's own "Space Viking" and two sequels to that great yarn by John, all for even less than the Kalvan E-books. I can't recommend these books highly enough to Wargamer-readers, especially those with an interest in the Pike and Shot era. It is hard to read these books without getting the urge to recreate some of the many actions therein on the tabletop, with your rules of choice! The second year of Medical School was a little easier, as the subject matter became more clearly relevant. Also, one of my classmates and I rented out a nice four bedroom condo right across form the Medical School (in suburban Farmington)... well actually, it had three bedrooms, plus a somewhat odd open space upstairs, evidently meant to be a family room or study. Mike and I erected wall sections between the pillars and installed a door, converting it to a 4th bedroom. We sublet the other two bedrooms to two incoming first year students, one of whom turned out to be from my home town. All three of them were good guys, and we got along very well, sharing cooking and shopping duties, and living in a very nice place for much less than it would have cost us for a dive somewhere else!. By this time, my friend from back home, Paul, had graduated from Lafayette college with a degree in Mechanical Engineering, gotten married, and was living in nearby East Hartford after taking a job with aircraft engine manufacturer Pratt and Whitney. I did manage to get over to visit Paul and his wife about once a month. 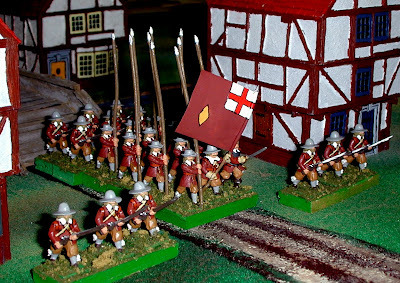 My Napoleonic figures were all back home, but I had my English Civil war Armies with me, plus my burgeoning number of small Ancient armies (see "Legio Quaternarius", the prior post in this series). 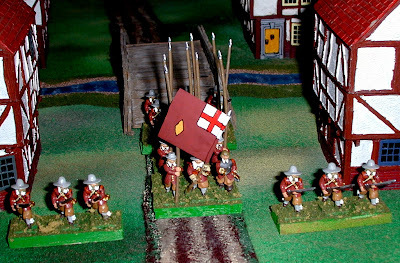 We play tested a few sets of Pike and Shot rules over at his place - using Gush's WRG rules, Cavaliers and Roundheads, and Bill Protz's rules for the ECW. All of these were OK, but none of them really quite "did" it for us. 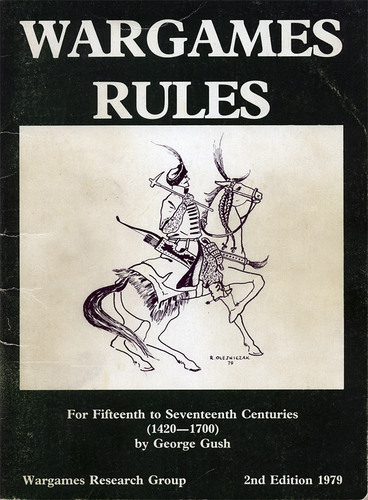 Indeed, I would ultimately have to write my own Pike and Shot rules decades later (Band of Brothers, 2nd edition, with Ken Baggaley and much hesitance from my good friends, Jope Fish and Gavin Shanks) before finding what I really wanted in a set of rules for this period. 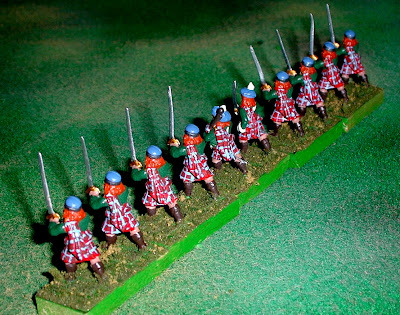 Some pics of my Mimifigs ECW troops from the 1970's in action. With the forces of Parliament opposite. The armies close! IIRC, these pictures are actually from a game Joe and I played about 10 years ago, using "Anchor of Faith" by Piquet. Paul and I played our games first with the WRG Renaissance Gush rules. View from behind the Royalist lines. 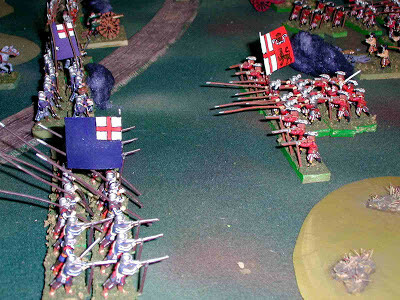 And from the Parliamentary side; gotta have hedgerows for an ECW battle! 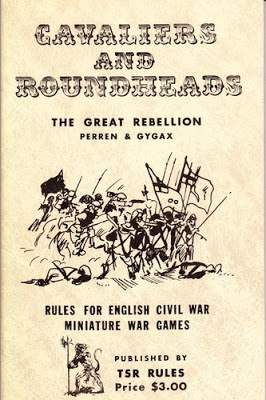 Next we tried Cavaliers and Roundheads - a lot more bloody and decisive, but still not really what we were looking for. 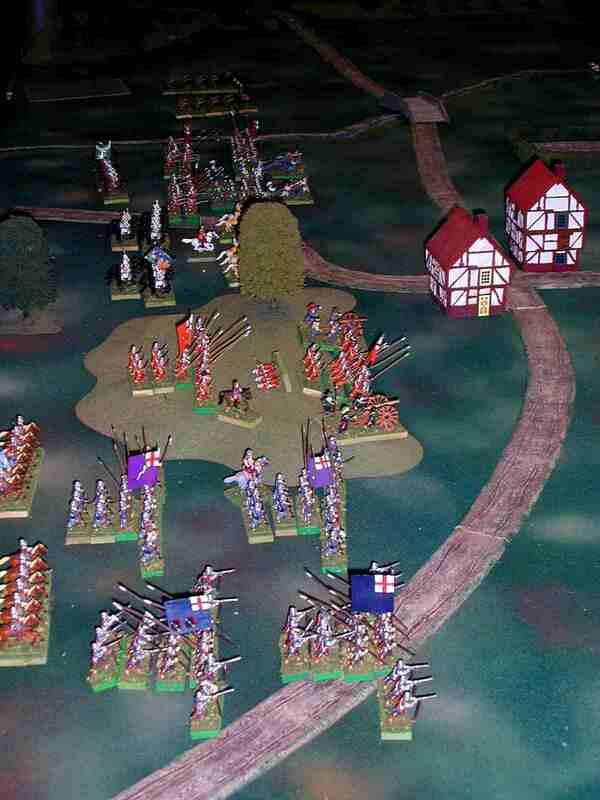 The Cavalier cavalry attempt to drive off some Roundhead Dragoons. Bill Protz's rules came the closest (I have the blue covered 1st edition) to what we were looking for. The King's lifeguard about to charge with a swamp to its flank. At the end of the second year of Medical School, they again gave us 4 weeks to study for Part 2 of the National Board exams. Having learned from the previous year, this time I painted for three weeks and studied for 1 week (and did even better). That completed my core Ancient Armies for our gridded Ancients rules (Assyrian, Carthagenian, Republican Roman, Macedonian, Indian, Palmyran, Sassanid Persian). 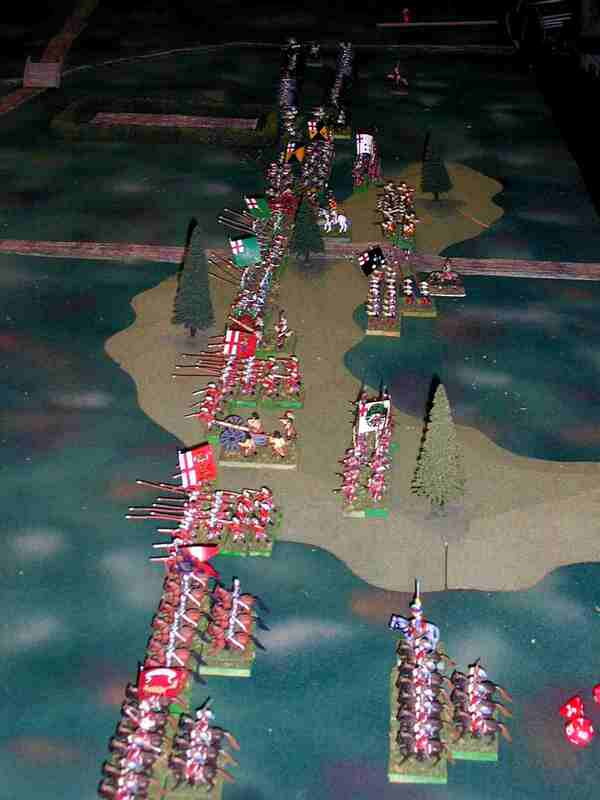 These armies saw a lot of play over the next 20 years. I even had Dave Sweet himself over to play a few times and he enjoyed the games and their tribute to the rules he and his dad had devised. The third year of Medical School was a huge improvement; a bit of an intimidating shift from the classroom to the bedside at first, but it rapidly became clear that I absolutely had made the right choice. Indeed, I was a bit surprised to find that I really enjoyed interacting with people, and quickly discarded any plans for a career focused on Research. I also became quite impressed with the ability we physicians had to harm people, not necessarily through errors or outright malpractice, but just in the everyday performance of our job; not even the most beneficial interventions are without some risk (well, except perhaps for eating better and keeping your weight down!). Although some rotations were certainly stressful and time consuming (making rounds at 6:30 AM with the surgeons on patients who were half asleep was interesting - I think they kind of preferred it that way sometimes, as they were too groggy to ask many questions, LOL! ), overall it was vast improvement from the first two years. Around this time (start of my 3rd year of Medical School, 19880), Dave Sweet finished Law School and moved to the Hartford area to start his Law practice, and Joe Fish finished his tour of duty with the Army. My good friend, fellow wargamer, and former college roommate, Chuck, also wound up transferring to the University of Hartford from UConn, and took one of the rooms in our condo when one of the other medical students married and moved out. I ensured that he actually graduated this time! As a result, Chuck sent me Mother's Day cards for about a decade there after as a funny way of thanking me for getting him through college. It certainly confused my future wife the first time she saw one come in the mail, LOL! Thus I was fortunate that just as I stated to have some free time again, many old gaming friends were now available as well. We played some Ancients games and some Starfleet Wars games in the unused Living Room of my condo over that time. 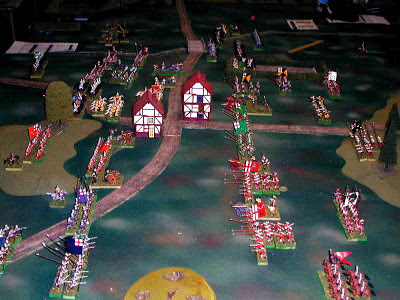 I also enjoyed the classic FLGS, "War and Pieces" in West Hartford. Even back in the pre-internet era of the late 1970's, I tried to support the store by doing my large figure orders through them, but gave up as it seemed like they felt it was more of a chore than it was worth to them (which may have been true, I suppose). In any event, it was a fixture of the Connecticut gaming scene for more than 25 years. I was sorry to see it close in 2007. Dave Sweet also started up a continuation of a Dungeons and Dragons campaign he had run in college, based on a sort of alternate late 1600's version of the islands off the coast of Maine (where Dave had worked as a camp counselor for several summers), centered on the island of Matinicus. Among others, this group included another of the former seniors from the original UConn wargames group, Rocco, now a newspaper reporter, the current State Insurance Commissioner (a pretty good contact for a future physician, LOL), and Joe Angiolillo, who has a number of boardgames designs to his credit. Eventually, it worked best for everyone's schedule that we customarily met on Thursday nights, thus becoming known as "The Thursday Night Group" (TNG), particularly in the annals of the broader events of the campaign World that Dave kept. The local ruler, the Archduke, the relic "The Iron Poker of Viazzo", and the calamity known as Taraka the Rakshasa stand out particularly from that time. One of the guys ran a "true" neutral (i.e., it's all about me, the rest be damned, LOL) character named Mark Rudd, after the activist of the same name. During the devastation accompanying his visit, Taraka gave Mark a powerful but dangerous magic item (a wand of Plague, I think), solely on the grounds that, as a true Neutral, he was bound to use it in a fashion that increased the misery in the world, thus serving the Rakshaka's ultimate purpose! He was not mistaken, as I recall. Joe Mike, who usually hosted the games at his home, had a Ranger as his main character, "Arrowsworn, son of Arrowroot", ior something like that, who was prone to lethal encounters. We used my collection of 25mm D&D figures for these games, and my Ranger figure was painted in a fashion that (inadvertently - I am NOT a baseball fan at all) bore a very striking resemblance to the Cincinnati Reds slugger, Pete Rose. As a result, the character was generally nicknamed "Pete Rose" during play! This was classic D&D, and thus most characters had a short lifespan; resurrection and reincarnation were often necessary to preserve characters of any reasonable level. My primary characters were Puremoon, a Lawful Good Cleric, who ultimately attained 9th level with the assistance of the local authorities. The area had become severely depopulated over the years by a series of disasters (the immense Tidal Wave created when the Iron Poker was used to create "Poker Bay" being only one of them), and the "magical" appearance of the Faithful Followers of newly raised Primates were one of the most efficient means of restoring the population! My other reasonably successful TNG character was a Fighter, who was reincarnated as a Griffon; this turned out to be very useful, and "Fleetwing" ultimately became a Baron, leading a large colony of Griffons established in the environs of Puremoon's castle! The only other memorable character of mine form that time was another fighter, Tisai the Dwarf; he was so named in response to the frequent request by creations of the DM to announce oneself. "Who goes there?" "Tisai, the Dwarf!". Needless to say, this eventually annoyed the GM sufficiently that the character ultimately came to a Bad End. As I mentioned, Joe Angiolillo, one of the TNG, was a board game designer, who worked for SPI, Coleco, and was one of the four founding members of Nova Designs, which originated as Gameshop. Joe's contribution to the founding of the company was a fascinating game based upon Norse Mythology, "The Hammer of Thor", which members of the TNG helped playtest a few times. 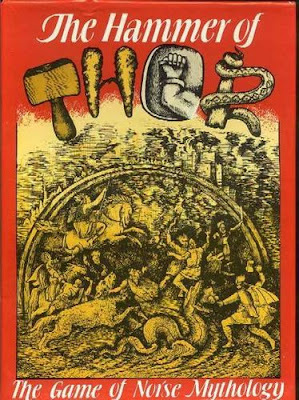 I thought it was a hugely creative game, and one that made use of a massive set of cards, many of which triggered events based upon Norse Mythology. However, it needed to be severely streamlined so as to play out is a reasonable period of time. I actually think this would be a great game to re-invent now as a PC game! The other game that Joe was assisting on a design for at that time was Axis and Allies, released by Nova games in 1981, and subsequently picked up by Milton Bradley. The only comment I made about this engaging game in development when we tried it at a session was to streamline it so that it would play to completion within 3-4 hrs, about the maximum for a game session, even for students! They wound up decreasing the number of territories on the map by about 40%, IIRC, and that more or less did the trick. I must admit I like the game much better with the plastic miniatures provided in the MB Gamemasters series version. Finally, another game produced by Gameshop/Nova was Al Leonardi's revolutionary design, "Ace of Aces". 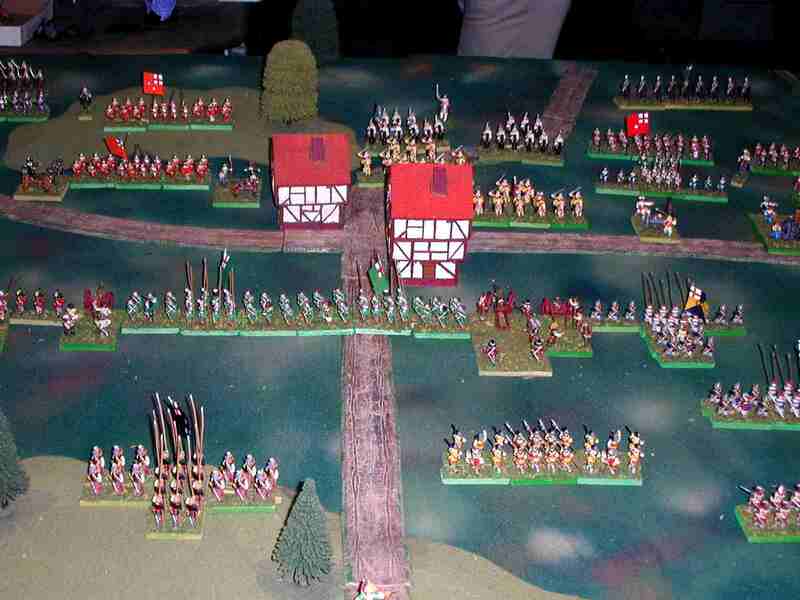 I must have been able to make it to the MFCA wargames convention in PA in 1980, probably the last convention I was able to attend for almost 20 years, because I remember seeing EVERYONE there playing this game. I bought a copy and Chuck and I played at least one flight (which only takes 15 minutes or so on average) daily over the next 6 months or so; I still have my 1st edition copies. Chuck had a better sense of spatial relationships, and would usually shoot my plane down three times out of four! It is hard to describe the game system if you have never seen it, but basically your planes start out facing one another at a distance. Each player then chooses a maneuver, which gives them a page number to send their opponent to, whereupon both flip to the indicated pages, which shows a drawing of the enemy plane in relation to yours, and the process repeats. If your opponent maneuvers such that your plane is in his sights, you are shot down! It is an incredibly fun and fast paced game, which is being re- released. I also recall a game or two of Empire 2 at Joe's home during this time, and purchased both that and the 3rd edition when it came out in 1981. The third edition really seemed to go overboard with added layers of complexity. I have since had the pleasure of sitting with Jim Getz (co-author, with Scott Bowden) several times at dinners arranged by Bob Jones at various Historicon conventions. Suffice it top say that he has long since moved past Empire (Jim is a very creative individual when it comes to novel ideas for wargames, including the Horizon Movement concept of about 10 years ago). That is it for now... good gaming, all! The Voltigeurs of the Young Guard were created from the two regiments each of the earlier Tirailleurs-Chasseurs (December 1810) and Conscrits-Chasseurs (February 1811), both of which were first first formed in 1809. 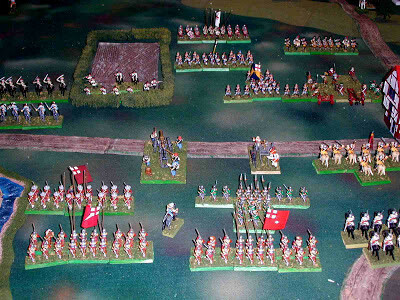 Details of these earlier formations can be found in my previous post about the Imperial Guard Infantry as it stood in 1809. 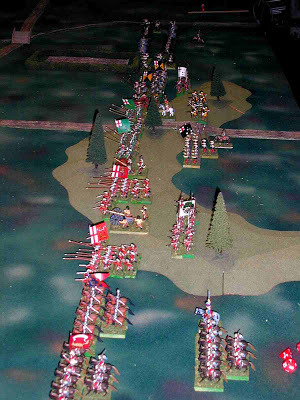 These first four regiments were progressively augmented in parallel to the increasing numbers of Tirailleurs (as detailed in my post on their evolution), reaching six units by August 1811, thirteen units by April 1813, and 19 regiments by the end of January, 1814, at which time the Guard comprised almost 1/3 of the entire army! Two Regiments of Voltigeurs of the Imperial Guard; 28mm Front Rank figures. 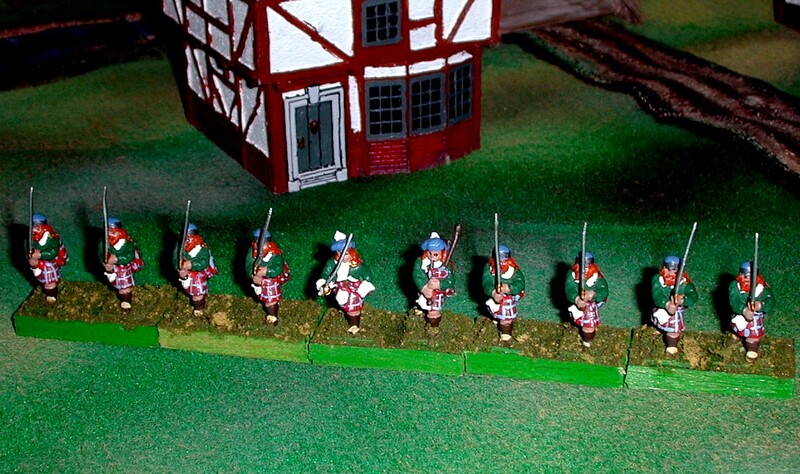 Another view of the two units; their uniform was based upon that of the earlier-Tirailleur -Chasseurs. 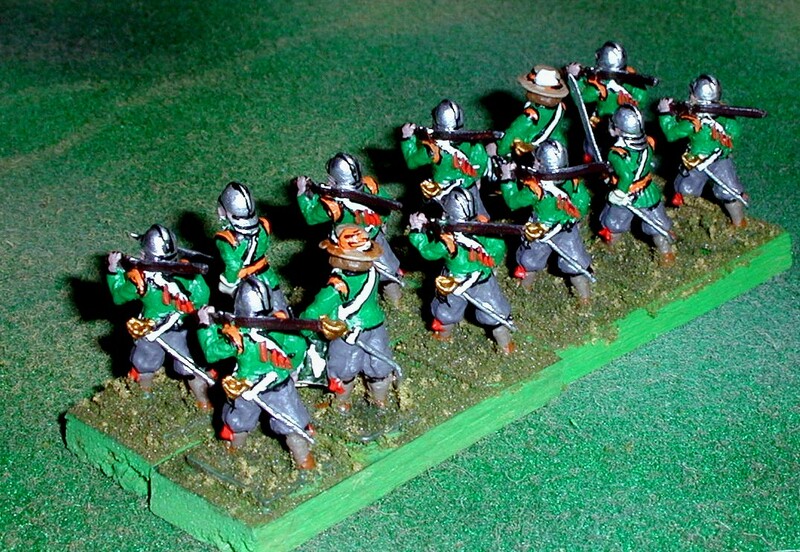 1st Regiment, Young Guard Voltigeurs. Changes from the Tirailleur-Chasseur uniform include green epaulettes with yellow crescents. 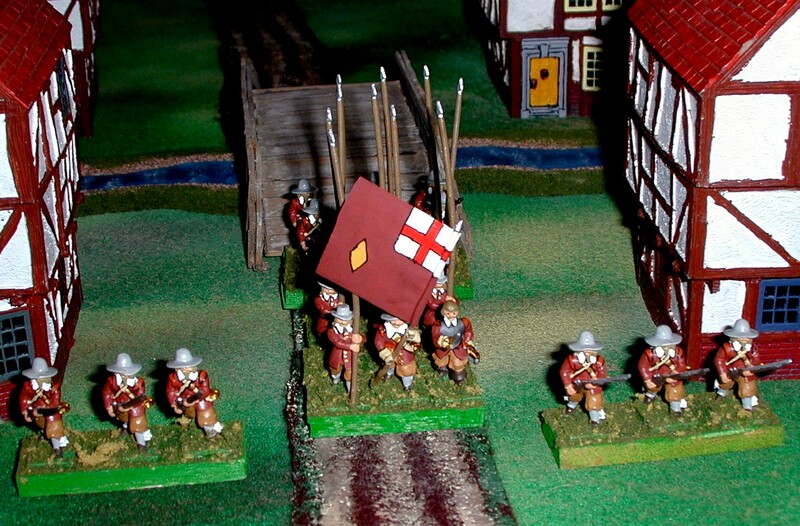 Another view of the 1st regiment; these units also adopted the yellow (or chamois/buff) collars of the line Voltigeurs. 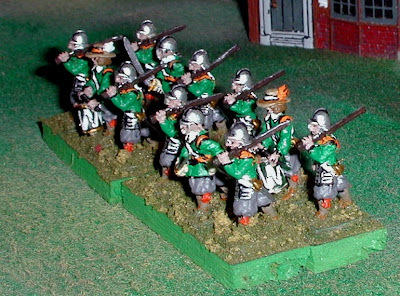 The plumes of the Voltigeurs of the Guard were red over green, but several sources indicate roughly even proportions of both, rather then the green tipped red plumes of the Fusilier-Chasseurs (and the earlier Tirailleurs-Chasseurs). I have, of course, opted for the roughly equally colored variant! 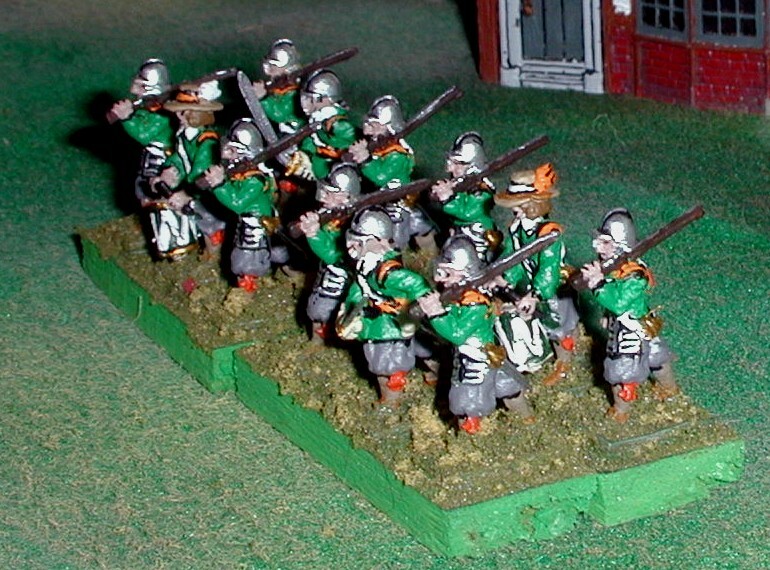 This unit is the 2nd Regiment of Voltigeurs. 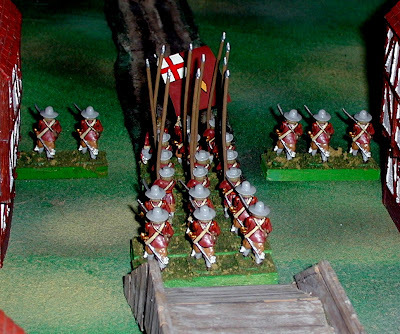 The Voltigeurs were authorized to carry fanions instead of standards/Eagles; these were to be red and plain, lacking any inscription that would identify them as belonging to the Imperial Guard. 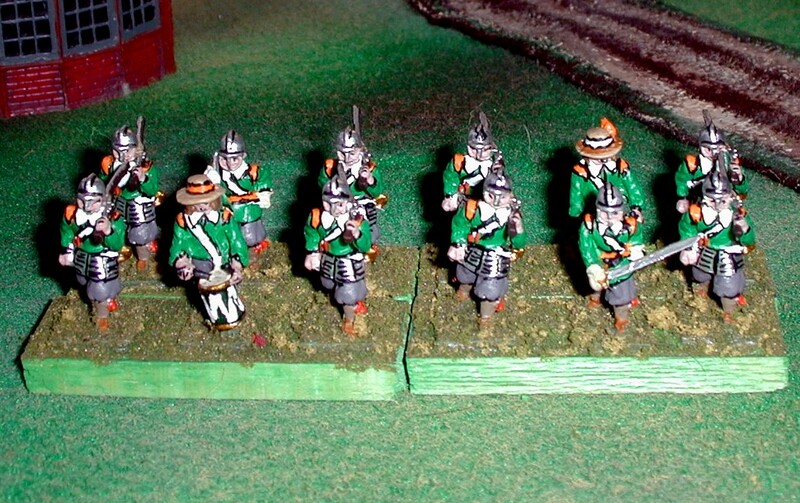 I have painted my 2nd unit with buff collars instead of the yellow collars I used for the First regiment. The Voltigeurs seem to have lacked the white lace "chevrons" at the sides of their shakos as worn by the Tirailleurs and Fusilier-Grenadiers and Fusillier-Chasseurs of the Guard. 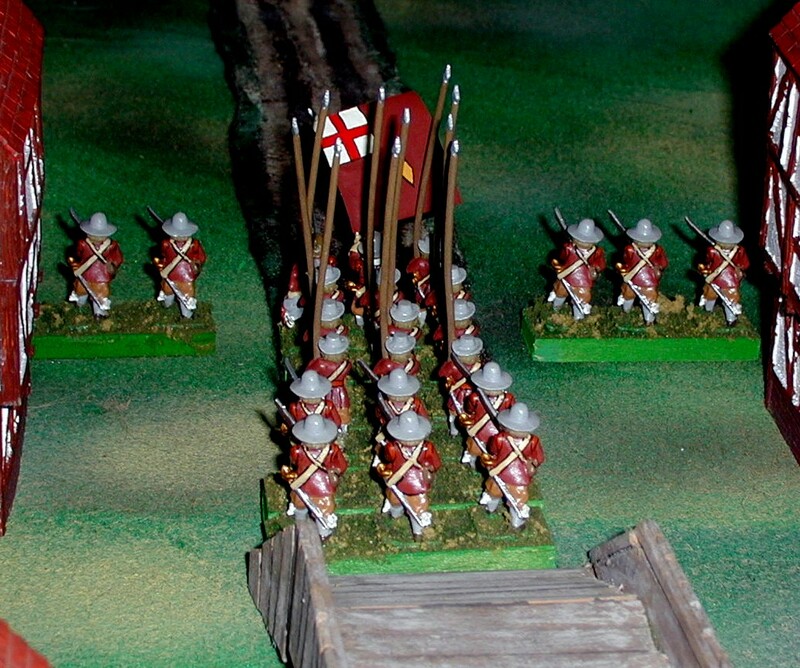 To command my Young Guard Division, we have a jumped up Colonel of Tirailleurs, assisted by an NCO of the Voltigeurs. The officers of the Voltigeurs generally worse the same uniform as the Chasseurs a Pied of the Old Guard (and thus also the Fusilier-Chassuers), with the shakos appropriate to the Fusilier-Chasseurs. The NCO shakos of the Voltigeurs had a gold lace band at the top, and the shako cords were of mixed gold, red. and green, similar to those of the more senior regiments of the Chasseur arm of the Guard infantry. 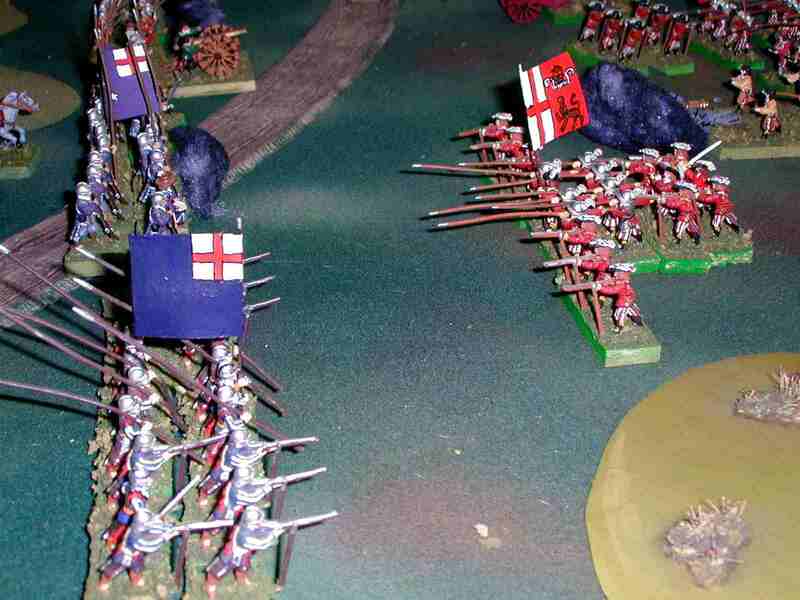 My two Voltigeur units are both in Firing poses, with the second rank reaching for cartridges from their cartridge boxes in the First regiment, and biting open fresh cartridges in the Second regiment. 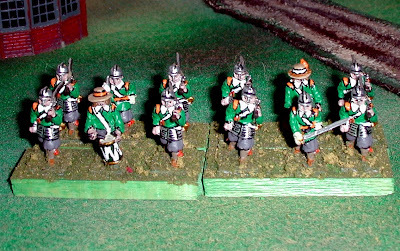 I like to have some of my Napoleonic infantry units firing, even though they are a bit more trouble to store in that pose. Ne tirez pas jusqu'à ce que vous sentez le schnitzel sur leur souffle ! 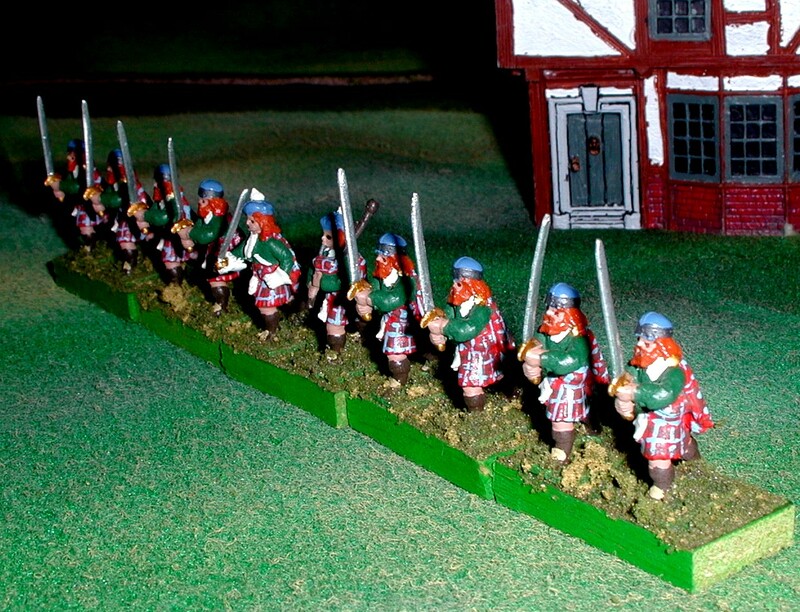 Some Roundhead Train guards, ideally armed with "Firelocks", as they didn't require burning slow matches in close proximity to large amounts of loose gunpowder! This is generic Parliamentarian unit, with the choice of green coats being arbitrary/aesthetic! 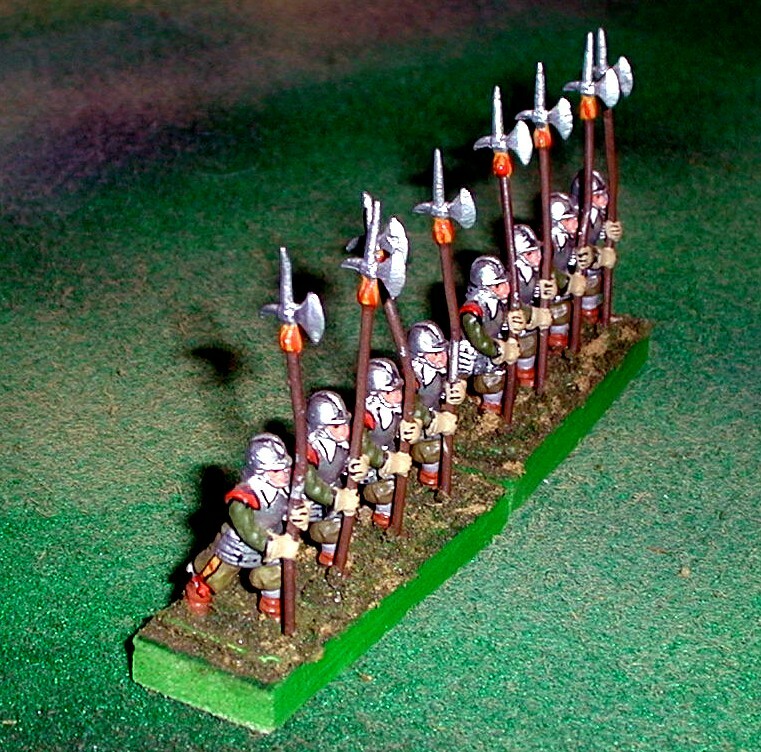 The rear view shows the use of the "black lining" technique used for painting these figures. the orange accents suggest their affinity for the Parliamentarian cause! 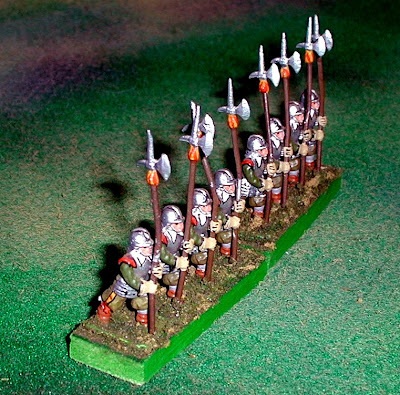 This small init of Halberdierrs is nominally from Devonshire; organized units of halberdiers were probably rare to non existent, but as they made the figure, I painted the unit! The black lining technique is very effective on these smooth surfaced, cleanly cast figures. 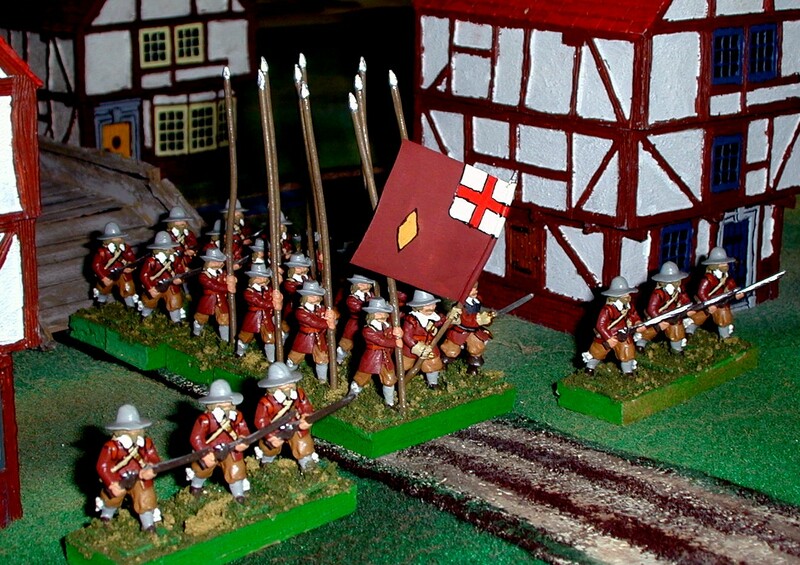 Next is a small regiment of Foote, that of Sir Thomas Grantham. 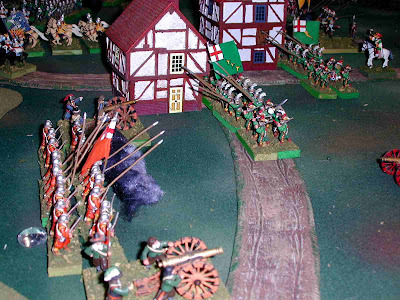 Sir Thomas was elected to the House of Commons for Lincoln for both the "short" and "long" Parliaments, and raised a regiment that fought at the Battle of Aylesbury in 1642. The "russet" (red-brown) colored coats are known for this regiment; the yellow diamond device on the flag is purely speculative. 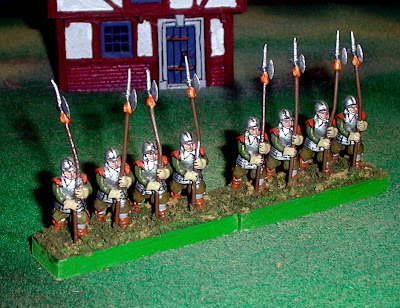 I have raised this unit as a sort of "back country" regiment with only basic equipment, relatively somber dress, only 1:1 pike to shot ratio, no armor, etc. Finally, a small unit of Scotts swordsmen fighting in alliance to the Parliamentarian cause. Scotland was of course a separate kingdom form England/Wales at this time, with its own, fairly well organized (Covenanter) army, composed largely of units of Foote armed with pikes and muskets. A final view, with the piper evident, the skirl of the pipes encouraging the lads forward as they did for centuries thereafter as well! The oldest pipe tunes are unknown, but "The Campbells are Coming" is probably among them. On searching for the tune on You-tube, I found this version by the 9th NY Pipe band. Curiously, heard them perform as a young teen at the meeting of the NY Military Historical Society, as related earlier in my "Of Dice and (Tin) Men" series. Indeed, I actually *have* this very record, one of the first dozen or so in my record collection as a boy (along with the 1812 Overture and Mussorgsky's Pictures at an Exhibition, as arranged for Orchestra by Ravel).